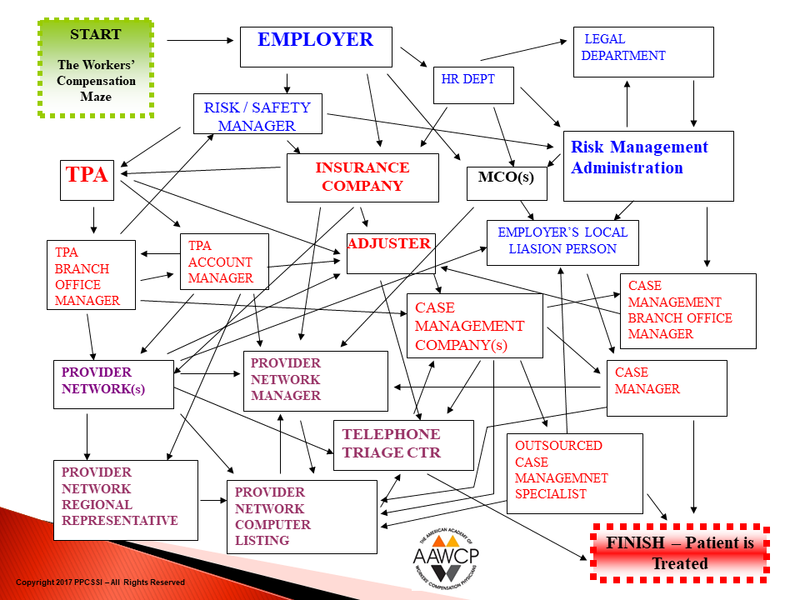 We are your guide through the workers' compensation maze! The American Academy of Workers’ Compensation Physicians (AAWCP) was founded to provide an adequate forum to assist Physicians who know and like Workers’ Compensation and want to make headway into the maze that is the current Workers’ Compensation industry. Many Physicians have shared with us that their Medical Schools did not train them in the nuances of Workers’ Compensation. And, while they like the fee schedules associated with Work Comp, they are frustrated and confused by the paperwork, back-to-work protocols and communications required in a Workers’ Compensation claim. The AAWCP vets and trains physicians and their staff in Workers’ Compensation insurance and provides them the resources needed to find and/or communicate with all parties. We provide a searchable database (by specialty) of all Physician members as well as a database of key contacts at insurers and case management companies. We also provide data on the industry and act as liaison between Academy members and the various parties. The Academy’s Mission is to train physicians in Workers’ Compensation and streamline the communications with all parties involved in a Workers’ Compensation claim in order to improve the outcomes for all parties...the patient, provider and physician. We firmly believe that the selection of the right doctor at the beginning of a Workers’ Compensation claim makes all the difference. The Academy is a division of Princeton Professional Communication. Since 1995, PPC’s subsidiary (Princeton Select Providers) has been helping the top physicians from major orthopedic and occupational medicine practices throughout the Eastern United States grow their Workers’ Compensation revenues.